The client needed to create an internal talent and knowledge matching Software as a Service (SaaS) system for all types of professionals and experts. 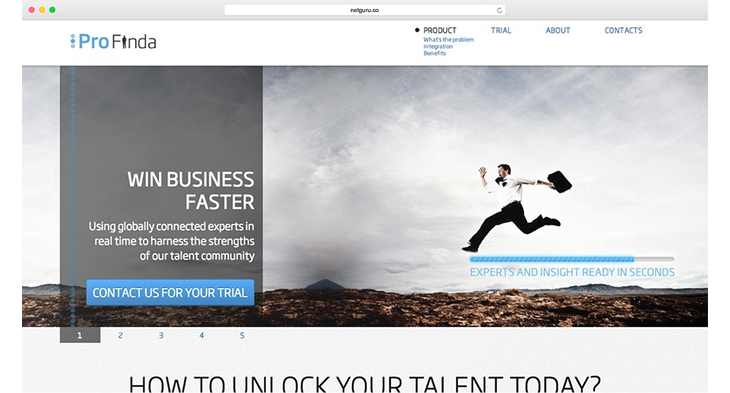 Making it easier to find the best possible talent and connect it to the right projects. Winning pitches, helping with tasks and supporting the client's needs. Building high-performance teams, driving superior overall organisational performance. Netguru offered an all-around solution, from development through testing to integrating the product with multiple services. Providing a ful-stack development team and additional services. Building new features and testing them thoroughly. Integrating the platform with Heroku, Google Analytics, UserVoice, CloudMailin & Engine Yard. ProFinda is a unique SaaS Cloud Collaboration Platform with an exceptional matching technology that helps users find experts for their teams. A platform that transforms businesses making team integration as easy as never before. The process of searching for internal talents streamlined and inconspicuous. Powerful real-time data on staff, departments and workflow.